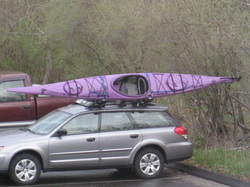 Necky Looksha IV Sea Kayak For Sale - AWESOME NEW AND USED KAYAKS AND BICYCLES! The following information was shamelessly lifted from Sea Kayaker Magazine's website in a brazen daylight heist. 10 knots, small waves, boat and ship wakes for surfing. seems to ease the 'Tupperware' look that many plastic boats suffer from" (TS). Like the Looksha II (SK August 96) it has a double chine. the bow would be an improvement. recessed deck fittings. The cockpit is "a nice size for easy entry and exit"
TS note the need for some custom padding. farther and offer more purchase" (RS) or be padded out by the owner. range. Without being a barge, the initial and secondary stability are good"
(TS). "Stable enough to fish from, yet it felt nimble and very responsive"(MH). until I got crazy in the rocks" (MH). in large steeper waves. Side surfs smoothly for controlled broaches"
stability and kept its "excellent" (MH) handling qualities. best plastic kayak I've ever paddled" (MH). some loose kelp or sea weed on the bow and not being able to get rid of it. Abbottsford, B.C., V2S 4N2 Canada. overnighter in winds to 15 knots, waves to 3 feet; gear load of 45 pounds. cargo and with 90-pound load. knots, chop to 3 feet, and clapotis. more comfortable just to hold the ends of the boats. provide a place to stow a conventional sectional spare paddle. quartering course that often results in broaching problems." "fairly fast boat" (DM). "It accelerated and held speed with little effort"
and with the back band and low cockpit it is easy to lay back." of paddling with 45 pounds of cargo. of the wood generated compliments from others on the water." ends on the bolts have been eliminated. multiple layers of fiberglass cloth. strap, foot braces, knee padding, lifetime warranty. retractable skeg, $100; day hatch with third bulkhead, $50.